Leather Sets There are 7 products. Luxurious and exclusive jewelry sets - author's work for daily wear and for going out. 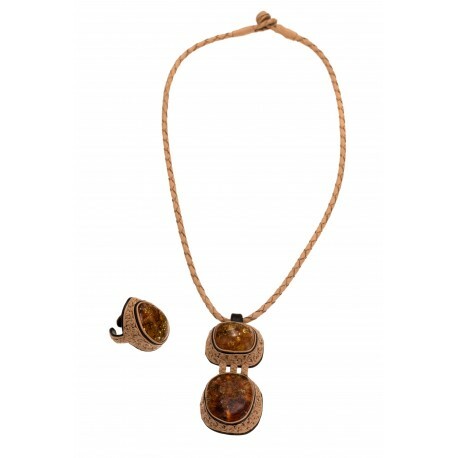 Sets of beautiful, adjustable bracelets, rings and necklaces made of leather and amber. We create the best quality set of hand-made jewelry for you. 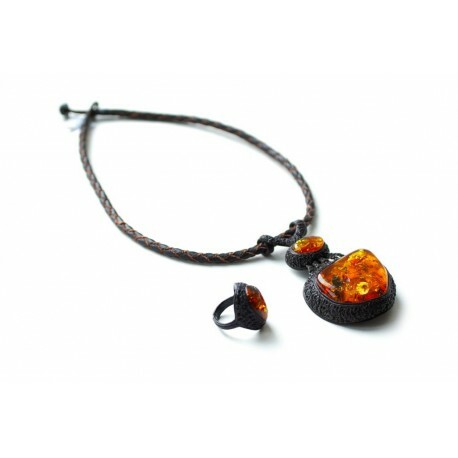 Leather jewelry set decorated with amber. A bleached coffee color frowned leather set with selected light yellow-color amber. 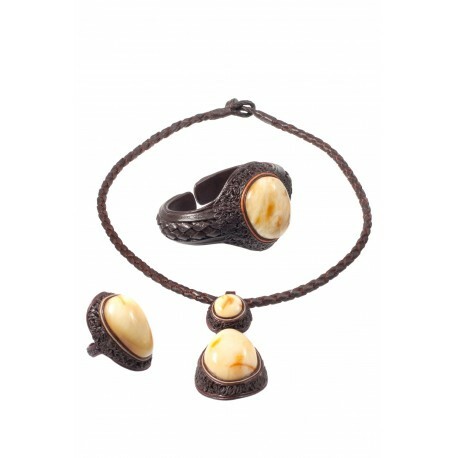 A beautiful set, that combines necklace, an adjustable bracelet and ring, braided with hand-made leather laces. A brown leather set - a necklace, an adjustable bracelet and a ring. Luxurious, exclusive jewelry - author's work for daily wear and for going out. 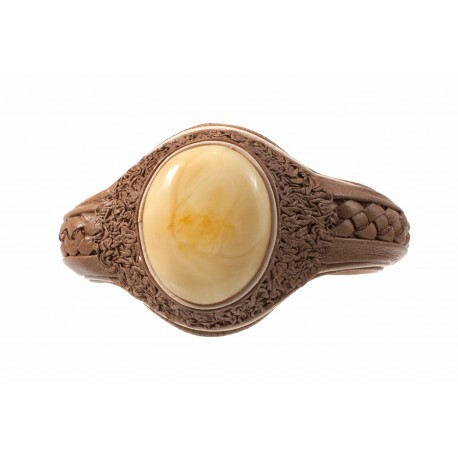 Sand-colored, hand-processed - frowned and plaited, the combination of leather and transparent, brown-greenish amber. 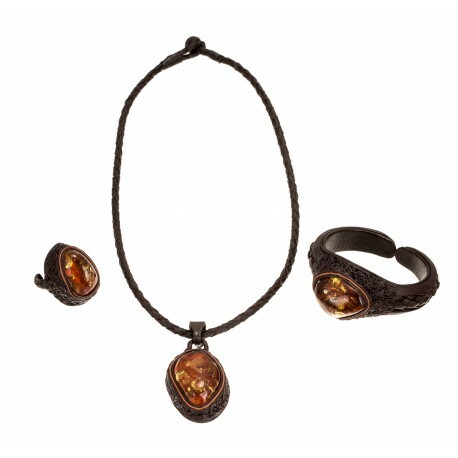 A necklace of seven braided amber nuggets and an adjustable ring - a beautiful set for an ordinary day and for going out. A noble drink - cognac color amber nugget will surprise you by the play of the happy "scales". Not less surprising is its friendship with brown, chocolate color leather, but the result - a charming, unique jewelry - ring and necklace - set - lovely and unexpected. 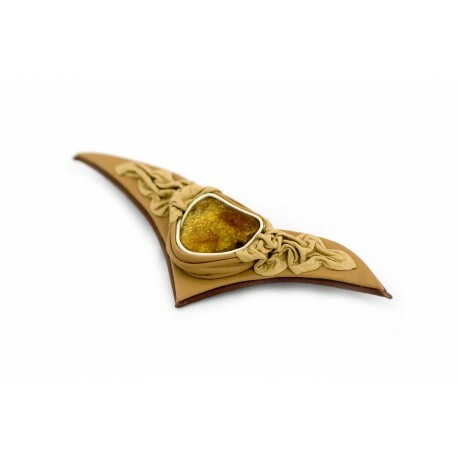 A bleached coffee color frowned leather brooch with clear cognac-colored amber that is framed in a white leather rim.